Mobiles no more remain a medium just to influence the audience and that they have shifted a lot towards becoming a conversion medium, accounting for almost 39% of display ad conversions during the third quarter this year in a number of countries. A recent report on it reveals that mobile ad conversions for display increased 4.4% quarter-on-quarter and 15.8% year-over-year. 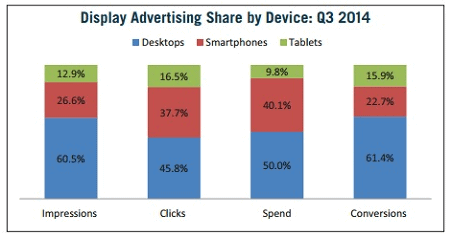 In fact, 40% of impressions and 54 % of ad clicks came from mobile itself.